Today’s post is an updated repost from April, 2016. It’s no secret that I frequently buy used and secondhand items for our home, for our kids, and even for Dave and myself. I’m not ashamed to borrow something from a friend or relative — and you all know how much I love Craigslist!! In fact, I guarantee the number of “new-to-us” items in our home drastically outnumbers the “brand new” items in our home! 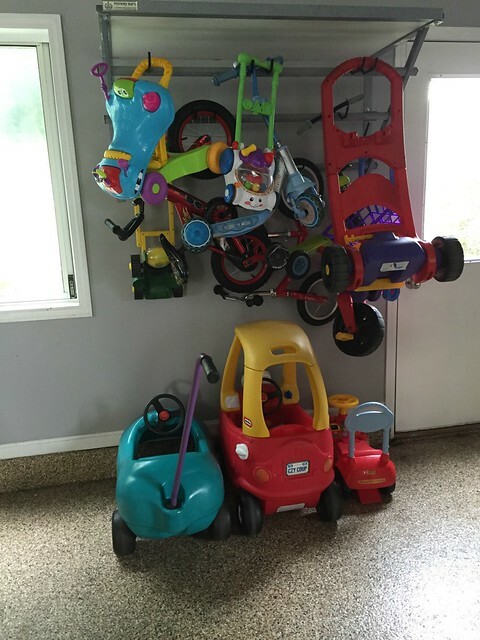 Both our vehicles are used, all our kids bikes, scooters, roller skates, toy cars, and other outdoor toys are used. Our kiddie trampoline is used, our swing set is used, our kiddie pool is used, all but 1 of our strollers were purchased used, even Dave and my bikes are used! Buying used is so satisfying for me, especially when I find exactly what I’m looking for! However, there are several other reasons we almost always buy used. Have you noticed how much packaging comes with new items — especially new toys and other kid/baby items? It’s CRAZY! Then, on top of all the packaging, there’s all the paperwork, manuals, instructions, warranties, etc. etc. — so much extra (and, in my opinion, unnecessary) stuff I don’t need. Even though I’m not a die-hard environmental buff, I still feel happy knowing that when I buy used, I don’t add all that stuff to landfills (or to my filing cabinet!) Plus, I’m a very visual person, so it’s nice for me to be able to see and touch the actual item I’m buying. When I buy used, I have the option to test out the item, make sure it works, make sure it will work for me (or the kids)… and as you can imagine, this alleviates many trips back to the store to return something that doesn’t work for us. Plus, anything that requires construction is usually already assembled or installed — which means less hassle for me once I bring the item home. I know how difficult it can be for some people to get to the point where they are ready to purge — so when I purchase something used via Craigslist, Facebook, thrift stores, or garage sales, I feel fabulous knowing I’m helping someone else declutter and simplify their life. This might sound silly, but it’s true. I get such a sense of satisfaction knowing that I not only found a bargain, but I also gave the seller a bit more breathing room in their home and life. Impulse purchases are a huge issue in today’s society — and a huge reason so many people fall into debt. We see something, we want it, we buy it. Done! However, since I’m pretty committed to buying used, I often need to spend a few days searching the internet, so I don’t have that same “hastiness” or impulsiveness to buy it NOW. If I can’t find an item used, we often just go without until I do find it — and sometimes we end up deciding that we really don’t need that item anyway. Plus, even if I DO find the item I want to purchase, it still takes a few more emails or phone calls to figure out a time/location to meet so I can make the purchase — I use this time to evaluate and reconsider how badly I need the item. If it’s not worth a 15 minute drive, then I probably don’t need it that badly. When I buy used, I rarely have any buyers remorse or guilt associated with my purchase because I usually get such a fabulous deal. Even in the few cases when I do decide that the product isn’t for me, I don’t feel bad getting rid of it again (either selling it or donating it) because I didn’t pay much upfront. I also don’t get upset if my kids ruin a “new to us” item of clothing or break a “new to them toy” because it most likely only cost $0.50 or maybe $1. It’s not worth getting upset over that amount of money — and if it was truly an accident, we just trash the item and move on with our day. I’ve blogged about all the different excuses people make to keep their clutter — and it should come as no surprise that guilt is entwined in many of those excuses. I can’t tell you how many times I’ve heard “but I paid good money for that” when trying to encourage someone to purge something they no longer need, use, want, or love. It’s hard to get rid of something you paid a lot for (I know!) — and that’s why I personally feel a lot less guilt if I’m able to score a fabulous deal. I’ve often thought about trying to calculate just how much money we’ve saved buying used — but I think it would be nearly impossible at this point in our lives. I’ve decided that the time and effort it would require just isn’t worth it. It’s safe to say that we’ve saved tens of thousands of dollars over the last 15 years of buying gently used versus new — that savings is one of the big reasons why we can afford to have Dave home all summer (instead of getting a summer job) and continue doing so many house projects. I realize buying used isn’t for everyone — that’s fine. However, if you have the opportunity to buy used, I’d encourage you to give it a try. 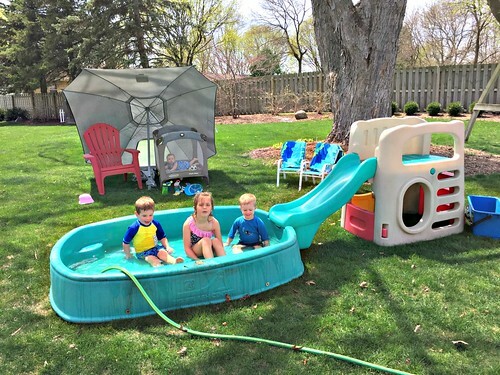 You just never know when you’ll find the exact item you were looking for at a fraction of the price… like that time I found the EXACT kiddie pool I wanted for only $75 AND they delivered it (fully assembled) to our home!!! I love buying used and reading about your finds! 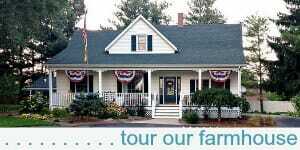 But I have to say, living in a very small town in very rural southern MS, I usually can’t find what I’m looking for. When things are posted on Facebook in our local area, they’re snatched up within seconds and very few people in our area use Craigslist. There’s no thrift store in my tiny town at all. There are a few about 30-40 miles away but they’re not great and finding clothes there that are quality and what we need is a day-long adventure. I’m sure with some effort, I could do better, but then there’s the time investment to search and search and search. I don’t wish I lived in a bigger town but I do wish I had some of the opportunities that you have! yeah, we are VERY fortunate to live in an area where there are lots of really great thrift stores! Thanks so much for the shoutout of my book, Andrea!! I think about the clutter factor too when I buy used. It makes me feel so good to take something off someone’s hands, and when I think about how much we buy new, I have a hard time wrapping my head around the massive amounts that must go to our landfills. We can all do our part to minimize waste! Great article! I love buying used, not just to save money, but the satisfaction I get from not having to spend time and effort going to the pricey mall and trying on overpriced clothes that will probably end up at the thrift shop anyway. I also find that used furniture such as vintage is usually better quality as many are made of solid wood as opposed to veneer or some other cheap material. Kids stuff is especially worth buying used as they grow so quickly and the clothes are barely worn. Same goes for kid’s furniture, strollers, toys etc. You have so much great information on your site that you can easily write a book yourself! As for buying used, I totally agree that the satisfaction of getting a great deal is the biggest thrill for me when it comes to finding that amazing bargain on a used item! YES! I have to admit that naturally, I am an impulse buyer. It takes great effort from me to curb that desire. But I also enjoy buying used! My husband and I have never purchased a new vehicle, and the majority of our kids’ items are also used. Personally, I think the “search” is kind of fun. Oftentimes if you are patient and willing to look long enough you can be “rewarded” with something practically new for a GREAT price! We just bought a triple stroller from Craig’s List. The new price was $370; we bought it for $150. It still looks quite new. It was 2 1/2 hours away, but an aunt was going to that city anyway! So now this pregnant mama can take our three quite-smalls on walks. 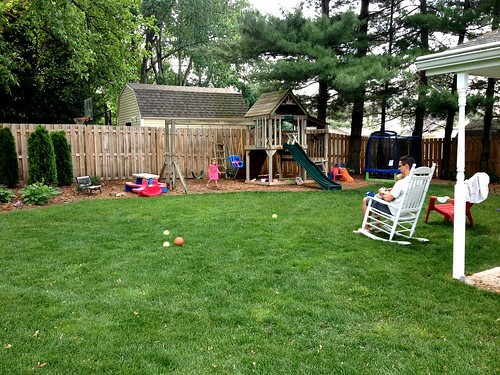 But what do we do in six weeks when we need a spot for the new baby? You say buy a used quadruple stroller? I think I’m drawing the line at a triple. wow — great deal! I’ve been looking for a used triple stroller. I just feel like it’s so crazy big, but at the same time, I know I would use it a lot the next couple of years! Good luck with baby #4! Funny thing, Andrea–until we got our two unexpected foster care placements in January, I was longing for a double stroller just like yours! This is, astonishingly, the second triple stroller I’ve owned. Foster care, adoption, and biology have thrown me some interesting combinations of ages, mostly under three. But still, to need TWO triple strollers in a few years’ time seems a little staggering, especially for someone who couldn’t carry a child to term for almost seven years. Both of my strollers were three in a long row. They aren’t nice for cornering in stores, but I love how they keep a whole pile of small people contained. The first one was a BabyTrend . I like our current Trio Foundations stroller better. Both take up a lot of space in the back of a van. 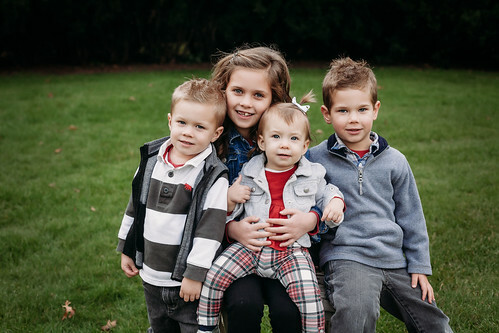 When I had three little boys between 8 months and not quite 2 1/2 years old, I said I could do all things through Christ, but a triple stroller sure helps. Hope you find yours soon! We still love and used our double stroller very regularly — in fact, we also still use our single stroller regularly too (so I wouldn’t really want to sell either of those to make room for a tripe stroller). The idea of having a single, double, and triple stroller is kind of crazy to me — but I know I can always sell things later, or pass them on to our siblings who don’t have kids yet. We’ll see, hopefully I can find a good deal before the weather warms up! I love shopping 2nd hand. Recently, after telling my husband that I got these shoes for my son for $10 on Craigslist, he asked me if we were that broke that we needed to buy used clothes. I said no, but if I buy used I can get him the shoes he needs and the boots and jacket that he wanted too! I love buying used, you can get so everything your kids want, not just what they need. I bought my washing machine from a woman I found on Craig’s List. She took excellent care of it and it has served me well. I love thrift stores and frequently buy gently used clothing there. Certain things I will only buy new but I am usually able to score good deals on them. Do you know what that large hard plastic pool with a slide is called? I have been searching for one for over a year and can’t even find stock images of it. I might even buy it new if I could find it! Ann, that’s some sort of “step 2 pool” (I think it’s Fisher Price). They have been discontinued for quite some time and it took me FOREVER to find this one. They were $150 – $200 and even used, they can be quite pricy. I got ours for $10 because the lady had no idea how much they were going for and it was missing the drain stopper. I purchased a stopper for $0.50 and we’re good to go! We buy used as much as we can. We live in such a tiny town that there’s not a lot available to buy used or it’s not worth the long drive to get there. We shop at consignment store and used bookstores around here as much as we can. A lot of times it’s just so much easier, and hardly more expensive, to order online. My daughter bought a really nice sewing machine on Craigs list for her 12yo daughter and I found a nice used machine for my DIL for Christmas! As long as I can test drive it I’m good! Also my van was used and I love it. When I buy used cars I always get more features for less money and I love lots of features! And all my pets were rescues. One time my neighbors were having a garage sale and they had a fridge out there without a price. I asked if it was for sale and they said make us an offer, so for $40 I got a perfectly good fridge for my garage. It really comes in handy at holiday time or when I need extra space. I love buying used because then I dont feel badly if an item is accidentally broken or destroyed. It helps us not worry about book pages being ripped and cars rusting after being enjoyed in the water. I love buying used toddler clothes because at least you know what they will look like after they’re washed, and you don’t have to worry about more shrinkage. Also, the toys I’ve bought used from our local Goodwill are some of my daughter’s favorites. That really makes me feel like I got a great bargain! I grew up going to garage sales every Saturday morning with my mom. Once a Goodwill arrived in town, we became regular patrons. Being raised this way, I don’t see any issue with buying used items. I love buying stuff for cheap, and you just never know what you will score! * Toys & Books ( We can het like new and expensive children’s books for .25 – .50 cents at yard sales. My children love to read and have always had a lot of nice books that I paid hardly anything for. I’m so use to buying used, that I rarely buy the things I have listed above new salary. Great article and reminder for us all! Hope you day is wonderful! My main reason for buying used is definitely the money savings! Another reason is that the items have already been assembled for us! We’ve had really good success in buying second hand and many items are resold when we’re done with them. I bought an exer-saucer at a yard sale for $3. It had been used for 3 children. I’ve used it for 2 babies here and will put it out at my next yard sale as it has lots of life left in it! However, today, my husband and I just went to a flea market where they sell used bikes. He needed one so he could ride more to work and use the car less, and we found a great deal. We even bartered and they took $10 less than the asking price. Now that’s when I’ll buy used! You would be surprised at the number of items we’ve bought used on Craigslist, and then sold them for exactly what we paid for them or even more. When you buy used, and you buy it right, most of the time you can use the item for free or even make money on it. Yes, us too Melinda! We’ve gone through so much furniture and baby items that we buy, decide we don’t like, and sell for as much (or more) than we paid for them. It’s so fun! Amen to all of the above! I didn’t really start buying used until we started having kids, and then looking at the prices of baby/kid items in the stores, I could not justify paying that kind of money for an item that would only be used for a short period of time. We bought 90% of our kids’ toys/gear and many clothes used and it feels good for all the reasons you listed! I only wish more people would do the same!! I’d say about 80% of my son’s wardrobe has been either bought through local consignment sales or bought/borrowed from friends. He still dresses primarily in name brands, and it has saved me a fortune! Most of my first son’s nursery came second-hand, mostly free. In fact the only thing we did buy new was a baby swing, which turned out to be a good investment because they replaced the motor- TWICE. Most of our things are used, furniture, cars, toys, baby clothes. I even bought my (closed circuit) breast pump used! The only thing I wouldn’t by used is a carseat. My son’s entire birthday and Christmas came from a consignment sale. I LOVE SECOND HAND. I’m all about buying used, but I would like to put out a few cautions. One: Check to make sure the toys/baby products have not been recalled or deemed unsafe. I bought these adorable soft blocks for my then baby at a yard sale only to look online on a whim and find that they were banned in several countries for containing a really yucky chemical (Needless to say, they went straight in the trash!). Also, I’ve seen several recalled (suffocation risk!) sling-style baby carriers on Craigslist and at Second-hand/Consignment Shops in our area. I’ve gotten in the habit of researching before buying if I can, especially if something will probably go in my little one’s mouth (and at this age, what doesn’t?). Two: When you’re looking to buy a car, compare prices of new and used. There’s been such a demand for used cars recently, that we found we could get a brand new car for about $4000 more than a similar older model used. We decided it would be worth the extra investment and have been very happy. On a side note, used cars can be a bit sketchy… A friend of mine recently went to trade in her car only to find out it had been totaled and re-built before she bought it. It didn’t show up on Carfax when she bought it because the insurance company had not reported it yet. It was a big headache to get the dealership that sold it to her to buy it back. I’d add one more thing, check very carefully to make sure that whatever you’re bringing into your home is free from bedbugs. Treating for them is VERY expensive and time consuming. We recently stayed in a very nice hotel room that had them and (unbeknownst to us during the stay) we brought a bug or two into the house when we first arrived home. We are so fortunate that I found the bites within 10 minutes of arriving home and so we caught them super early (had a bed bug dog sniff two days after we got home) so hopefully one treatment will be sufficient, but I’ve since learned how easy it is for them to travel in teeny tiny places, especially on used furniture. I’ve been working now for over a week to prep for the house to be treated and luckily the hotel is covering the $2500 price tag to eradicate them, but it’s definitely something I’ll be much more aware of from now on! wow — yes, good point! I’m glad the hotel is paying that HUGE fee for you! I’m not a big traveler, but stories like this make me want to stay home even more! Another great post Andrea, I can so relate. I bought so much for my kids via ebay and nearly new sale., I saved so much money and instead of fattening up the pockets of large commercial organisations, I passed on my hard won earnings to other parents and saved the landfill. I was also blessed with many hand me downs from friends and family which I hugely appreciated as a new mum. I made sure that I passed my things on to other new parents to carry on the circle. Last but not least, thank you for gorgeous video of Nora! Who couldn’t smile at that? I believe all of these are great points. I shopped at thrift stores more out of necessity when I started. However, even if I had millions, I still believe it best to be frugal when possible. Thrift stores in my area often have a monthly calendar of their specials. Many have weekends when clothing items are fifty cents. I even bought my kids’ winter coats for fifty cents each one year! Buying used allowed me to buy everything I needed instead of one item at a time. When a young broke family can fulfill necessities; that just makes sense! What a great reminder- I used to buy a lot more used, but the conscience of new has been getting me lately. If love to see a post from you on secondhand stores vs Craigslist, what’s better to buy at each, that sort of thing! I love treasure hunting! When I buy new kids clothes, I will see another kid in the same outfit at daycare. Not like my daughter cares but I don’t want their clothes to get mixed up if I paid $10 for a shirt. At a garage sale, I can usually get nearly brand new kids clothes for a fraction of the price and no one else will wear it. Plus if it gets a jello stain or lost at daycare, it’s no big deal. I also love finding vintage things, especially barware for my husband, glass is pretty durable and easily washed. #5 Is excellent, I hadn’t considered that. But on Wednesday night I put my wedding dress on Craigslist, for free. Its from 1996 and I thought maybe someone could use the fabric for something. I didn’t store it and I didn’t try to keep it clean. It’s been hanging in my closet for 17 years. We’ve been doing some cleanout/purging lately and it was time. I’m never going to try it on again, my daughters don’t want it for their weddings (1996…not a great style year) and it’s just taking up space in my closet. I got FOUR calls for it. One woman sounded really disappointed that I’d already arranged for someone to come get it before her. The woman that came and took it yesterday said she was going to make doll clothes out of it. 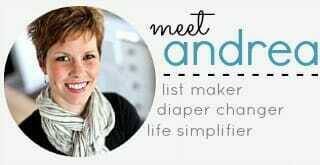 So not only does she help me with my clutter, I helped with her hobby and I don’t feel like I just threw out my wedding dress. Win win. I have yet to buy something from Craigslist, but I do keep an eye out for things, I just usually decide I don’t really need it – or it doesn’t warrant the hassle of contacting and traveling to see the item. When my girls were little, used clothing was more the rule than the exception! I could not justfiy buying all new clothes when they would grow out of them in a matter of weeks. Some of our best toys were used, too. I TOTALLY agree. Unfortunately I’m in a not-so-great area of Los Angeles so buying used is not as easy as it was when I lived in the midwest. But still, I agree with all your points. I fully agree with you on all of the above topics. Well said. Two reasons I love buying used is that there is usually little to no depreciation. I can turn around and sell the item when I am finished with it for pretty-much the same price I purchased it for. Sometimes, if I bought an item at a garage sale for a good price, I can even take the time to sell it on Craigslist for more than I originally paid for it. The second reason I like to buy used is because I read an article about how much of the items that go to Goodwill/thrift shops end up destroyed. They ship tons and tons of clothes overseas but even with all that is resold or donated, they still have to burn many tons of clothing each year. Our society is so into consuming that there is no way we can consume all that is made clothing wise even with sharing in the rest of the world. Shopping for used clothing takes a bit more effort but I am almost always able to find what I am looking for. I agree Megan. Nearly every Little Tikes toy that my kids had growing up was bought at garage sales. I would take it home clean it up and I sold every single piece for at least as much as I paid for it several years later. And the cool thing was we would sometimes score toys that were no longer made. A Little Tikes washer and dryer and a gas pump. (Andrea, you would have loved that one. The gas pump was sitting dirty in a yard at a garage sale. I asked if it was for sale and how much. The lady said make me an offer. I offered a dollar thinking she would counter. She said it’s yours!!!) My girls and the neighbors played gas station for years with that. I sold it years later for $5. Yes Megan, I didn’t even think about the “no depreciation” factor. I can’t even tell you how many times we’ve sold something for as much (or more) than we purchased it for — and that’s after using it! I had one mentioned to my husband that I wanted a convection microwave oven- and he called me on the cell phone that he found one for $15 at the thrift store and it was like new! I said buy it! A few months later when we were at a new appliance store- we saw the same exact one for $400! We were thrilled. Then after 5 years of use and needing to get a littler microwave- we sold the used convection oven for $150 on ebay. They were still going for $400 and on up for new and people bidded to $150 for our used one. We got a high end washing machine for FREE (it was less that 2 years old!) because someone was upgrading and it didn’t “match” their dryer. All hubby had to do was pick it up! And we just got a used dishwasher (4 years old) for $100 to replace our 11 year old one (which is on it’s last legs). 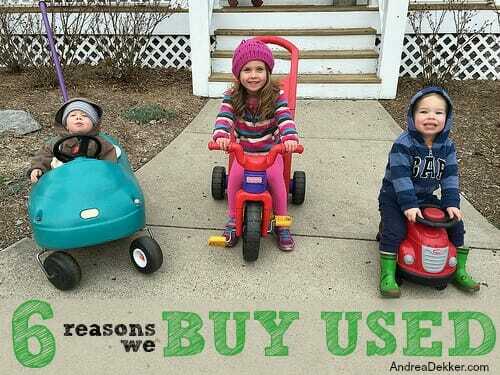 There are so many great reasons to buy used! Not to mention, for many of these items, they’re ending up in a landfill if not reused. There are numerous reasons I buy used. First, a lot of times the new item isn’t as high of quality as something older…and it has survived the test of time. I don’t know how many times I have bought a new garment and it has fallen apart before six or so washing. 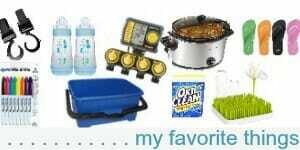 Things for the kitchen, etc….the newer items are often shoody quality. I like saving the money. I like keeping things out of the landfill. I like the neat treasures that I can find that often not made anymore. I like helping the non-profit thrift shops that I frequent….because when I buy from them, it benefits their cause. I like saving the money. Feels like a win-win to me. And I find I buy less this way…not as tempting as you said….I am looking for specifics most times and it teaches me patience. I absolutely with you on this bandwagon 🙂 Most furniture in my house is used, and of the shabby kind, I love the look. I also love buying old kitchen tools. I have been lusting after another Le Creuset casserole (have 3 Le C items, which I love and use), and just recently the new Soleil colour was released in South Africa…imagine my joy when I found the exact size casserole (very vintage) dish, not Le C, but the same yellow colour, for the princely price of R125 – that would be ± 10% of the full price!